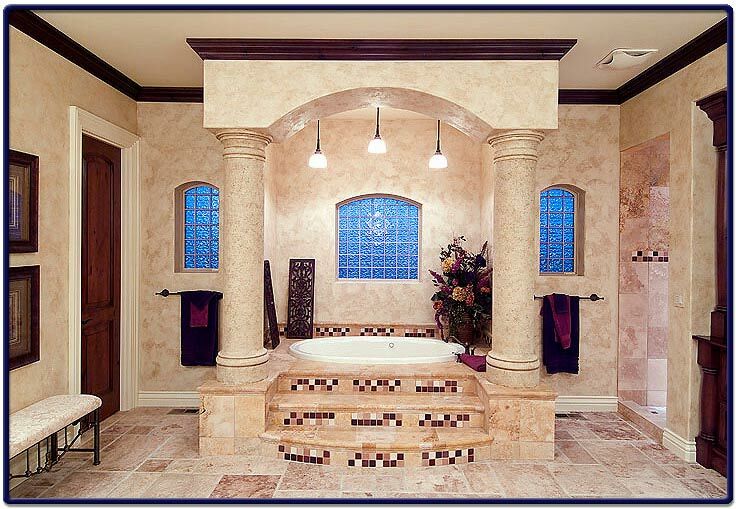 This is a picture of large Mediterranean style master bathroom. The bath area has Greek style columns or pillars as well as steps that lead up to the large bath. The foundation that surrounds the bath and the floor is composed of Italian Travertine tile imported from Tuscany. The windows are made of glass tile blocks or bricks with stainless glass windows that add brightness to the bathroom itself. The master bathroom also has has an enclosed shower area to the right of the bath.